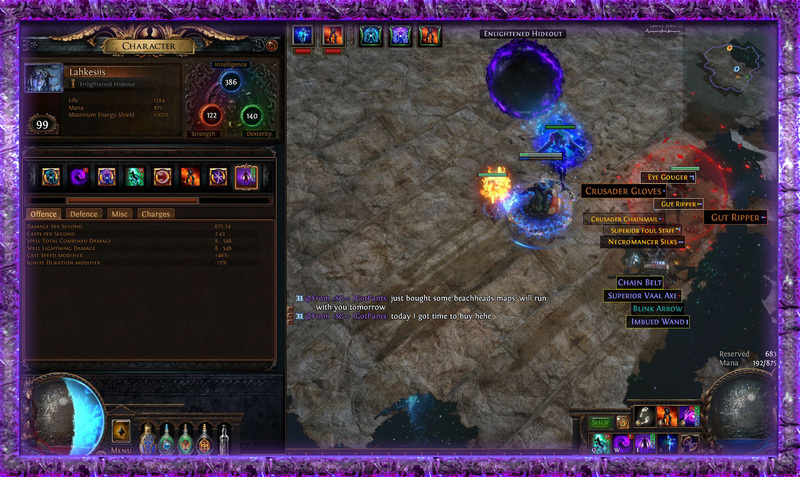 Path of Exile Occultists is suited for Witches with a focus on chaos damage or curses. Malediction substantially enhances curse specialists, whilst Profane Bloom and Void Beacon amplify the output of chaos harm. Occultists are well-served by builds that rely on & maximize energy shield. Occultists also may serve as a generic way to generate Power Charges in builds which lack other means of doing so. 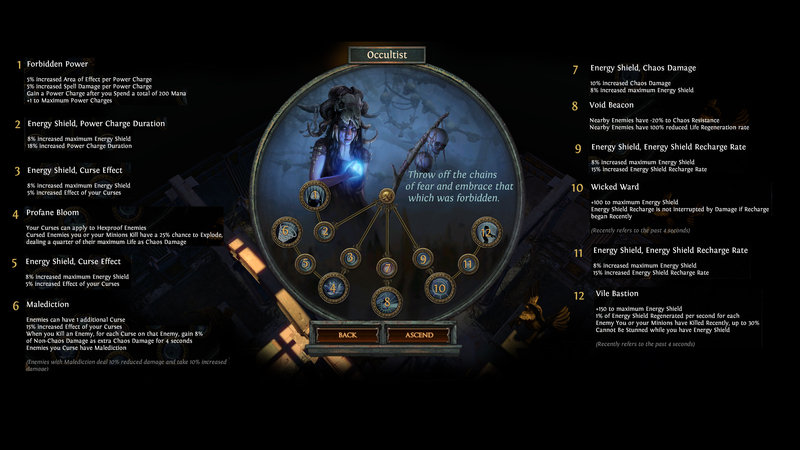 In this Post, U4gm Will share 4 POE 3.3 Witch Occultist Builds for you. Nice build. I’m thinking of going for something similar. It’s a strength stacking Doon Cuebiyari build. I’m not an RF expert, but I took a Guardian LL Build and just tweaked it around. Let me know what you think. It has 10k ES and 11k (22k with Rumi’s) Armor, but less Max Resists (81/80/79). I have two itemization sets; default is end-game and a budget version. The budget has about 6k ES with 9k (21k with Rumi’s) armor, with like 1-5c items in each slot. Not sure if Prism Guardian is expensive early game, but can just use Rise of the Phoenix and drop a few auras. And it’s probably better because you don’t have 21 PoF old game. The downside to the build right now as I see is that whilst it does more harm than the guardian version of LLRF, it is pretty glass-cannon when it comes to physical harm reduction/mitigation (also doesn’t cap block). Even not sure about the ES regen. The occultist passive to ES when kills enemy should boost the ES regen, but I can’t be sure until POB rolls out the new update to include the changes. The cost of the build can also be a downside for some people since most of the gears are pretty expensive. But since this is an LL build, and I don’t have a problem with accumulating currencies, this is fine by me. Life regen node was taken because I take Zealot’s Oath, which converts life regen to es regen. I feel that the ES regen is needed since ES is our primary defense mechanism – We just stack es and es regen and RF damage scales with ES. Also, just having max fire res alone is not enough to stop the degen from RF. I am looking at the raw regen stat from POB, and it is still not as much as I had hoped (compared to my current Guardian LL RF). If the new Occultist ES regen node works nicely, then obtaining the base regen is quality of life (If you depend on only killing enemies then you are pretty much screwed when you have to backtrack or when you are facing bosses). More regen also means tanking traps in the uber lab if you are looking to run labs as well. Presence of Chayula amulet converts 20% of our max life to ES, so getting a max life is also a good thing if the path to ES nodes takes too long. The purity of Flesh gives us chaos res as effectively, which is always good since we already Overcap on ELE res. But then again, I haven’t optimized the tree yet/waiting for patch note to drop and see if there is any juicy ES item so I can path tree differently. So skill tree is tentative to changes. Made this build as my starter in the abyss and I have to say I love it so much. In the beginning, it was super easy to level with blight/ed/contagion and with allelopathy gloves early maps were accessible too. Once I got Death’s Oath going, Maps are a breeze, and I just now killed t11 elder deathless, so I have that going for me which is nice. This build has terrific synergies with occultist, curses, and jewels. I have to say the allelopathy glove corrupted with +1 to socketed gems is impressive. This way you can have a high-level blight and essence drain in the same glove which is perfect for single target. Stack debuffs from Occulist, despair, disease, and wither. Then stack harm from death’s oath, essence drain, and blight. You melt everything. Revamped the build guide(Things like gems, potions, gear, passives, ascendancies, pantheon, and so much more has been looked over and edited for the better). That is a buff. General spelling and organization of tags. Might have fixed punctuation as effectively. I’ve killed most bosses with it, excluding veal temple, shaper, and guardians might try them in the future. At the same time, it’s the laziest build I have done so far. Void beacon merely is too good to pass on, unless you want to add somehow enfeeble to the build as the third curse just goes with the vile bastion, void beacon, and profane bloom in that order. Nearly no changes to the tree but added some attractive options in eq (shaped and elder items).